Pavenham and AFC Oakley M&DH both won Beds Senior Trophy ties away from home against opposition from the Spartan South Midlands League on Saturday. James Owen was the Pavenham hero as he grabbed both goals in their 2-1 victory at The 61FC Luton. Whilst AFC Oakley M&DH needed a penalty shoot-out to win at Totternhoe after 90 minutes play had seen the sides deadlocked at 5-5. Jack Hoogstraten and Alex Liburn both scored twice alongside an own goal to bring up the nap hand inside normal time. Then goalkeeper George Ripley became the shoot-out hero with that vital save in their 4-3 shoot-out success after team-mates Hoogstraten plus Ali Smith, Ollie Plested and Elijah Hukin had netted from the spot. In Round Two both sides will again face SML opposition but this time at home. M&DH will host Kent Athletic who won 5-1 at Shefford Town & Campton, for whom Jerome Mullings netted the lone goal. Whilst Pavenham will entertain Ampthill Town. Also now due to meet SML opposition in round two are Elstow Abbey who will entertain Arlesey Town Reserves at the Warren following their penalty shoot out win at Eastcotts AFC. Abbey took the lead in just the second minute when Glenn Tumulty netted and then doubled the scoreline on the half-hour mark via Jahi Bingham to be 2-0 ahead at the break. However, two goals from Junior Wilson in the second period saw us with a 2-2 scoreline at 90 minutes and a penalty shoot-out to decide the winners. That was to be the Abbey who in going first netted all five via Tumulty, Bingham, James Cane, Grant Williams and Cameron Babayemi whilst along the way Abbey goalkeeper Mark Reynolds kept out the first home effort for a 5-3 shoot-out win. 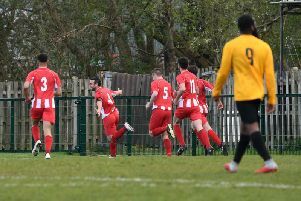 For Renhold United it will be a home round two tie against Ickwell & Old Warden after they won 3-2 at Cranfield United. Alex Woolston, Jason Allison and Aran Hazelwood netting the vital goals against two in reply from Martin Holland. Whilst AFC Kempston Town & Bedford College will now welcome Sandy to Hillgrounds in round two after they netted a 5-1 home victory over Wilstead. Courtney Boughton led the way with a hat-trick supported by goals from Jake Duxbury and Joe Price to bring up the nap hand against a lone reply from Michael Jones. For Flitwick Town it was an extension of their unbeaten ways up to five games and maintenance of their season 100% home record to climb the table into fifth with a 2-1 victory over a Sharnbrook side losing their fifth game on the bounce. Ashley Crowther and Daniel Stafford were on the home scoresheet against one in reply from Shaun Barnett. Elsewhere, Ampthill Town Reserves now find themselves in seventh after they recorded their first home win of the season by beating Caldecote 2-1. It was the visitors who led at half-time via a goal from Joe Baker until the Town’s Phil Matthews levelled matters in the second period before converting a 90th minute penalty to secure all three points for his side. The new leaders of the Division One supported by Wests Citroen Bedford league table are Stevington who maintained their unbeaten ways by winning 7-1 at Riseley Sports. Kieran Souter and Joe Holyoak both netted twice to go alongside single strikes from Tommy McGirl and Alex Smith plus a penalty from James Bourke. The lone Sports reply came via Jack Healey. Whilst Sundon Park Rangers moved up into second spot when sharing the spoils at Queens Park Crescents from a 2-2 draw to maintain their own unbeaten ways. Shaka Anderson shot them ahead in the 49th minute until two goals inside four minutes either side of the hour mark saw the home side lead 2-1. Anish Khinda made matters all square from the penalty spot before Daniel Rasol placed them ahead. But with the game into time added on up popped Matthew Conway to net the equaliser and save the visitors unbeaten record. Elsewhere, Meltis Albion now find themselves in fourth spot after goals from Ryan Kelly and Sylvester Mulenga gave them their first home win of the season in a 2-0 success over Shefford Town & Campton Reserves. Whilst in sixth spot are Ickleford who netted a 5-2 home victory over second from bottom of the table Houghton Athletic. John Vooght led the way with a hat-trick and joined on the scoresheet by Lewis Littlechild and Giuseppi D’Anglelo to bring up the nap hand against Athletic replies from Glen Collins and Jordan Thomas. However, still sitting on the bottom of the league table and awaiting their first point/points of the season are AFC Oakley M&DH Reserves who were beaten 2-1 at home by Westoning. Michael Armitt and Lewis Wilson netting the goals to do the damage against a lone home reply via Mitchell Crook. The lone game of the day saw Westoning Reserves climb to the top of the table with a 4-2 home win over Stevington Reserves. Martin Murphy with a hat-trick plus Ryan Camp on the home scoresheet against replies from Jordan Clarke and Cameron Cain.